Where is Cerro Ballena located? Cerro Ballena is located along the Pan-American Highway, just north of the town of Caldera, in Chile’s Atacama Desert. It is about one hour north of Copiapó. What was discovered at Cerro Ballena? The site contained the remains of 10 different kinds of marine vertebrates preserved in four separate layers. The vertebrates included aquatic sloths (one species), billfishes (two species), seals (two species) and several other species of whales (at least four species, including baleen, true oceanic dolphins, extinct walrus-like whales and extinct sperm whales). The skeletons of more than 40 individual large baleen whales dominated the site. One of the three fossil seals discovered is also new to science and will be fully described in a future work. Why is the site important? Cerro Ballena is the first definitive example of repeated mass strandings of marine mammals in the fossil record. It is the densest site for individual fossil whales and other extinct marine mammals in entire world. In this way, it is similar in significance to the La Brea Tar Pits or Dinosaur National Monument in the United States. Catastrophic mass death assemblages are rare in the fossil record, and it is very hard to find a “smoking gun” for their cause. The paper’s authors contend that toxins from harmful algal blooms killed the marine animals at Cerro Ballena. This is supported by several lines of evidence at the site and modern examples of such mass strandings with similar causes. Cerro Ballena preserves marine predators that are familiar to modern eyes, like large whales and seals. It also preserves completely extinct and bizarre marine mammals, including walrus-like whales and aquatic sloths. In this way, the site is a window into ancient marine ecosystems along the coast of South America. How was the site discovered? 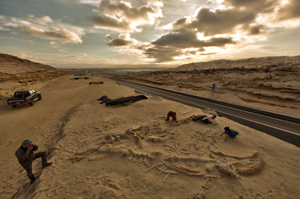 In 2011, paleontologists from the Smithsonian and Chile examined the fossils and recorded the findings before the site was paved over. The Smithsonian’s Digitization Program Office, using 3-D technology, provided a time-sensitive solution to document fossils at the site before key data was lost. How did all of these fossils arrive at the site? The skeletons of the fossil whales and other marine vertebrates were preserved in four separate levels, indicating a repeated and similar underlying cause. The orientation and condition of the skeletons point to death at sea, prior to burial on a tidal flat. The paper’s authors contend that in the late Miocene (5–11 million years ago), toxins generated by harmful algal blooms poisoned many ocean-going vertebrates near Cerro Ballena through the ingestion of contaminated prey or inhalation, causing relatively rapid death. The carcasses were washed into a tidal flat. Eventually, the carcasses were buried by sand. The four separate layers indicate this pathway from sea to land happened four different times during a period of 10,000 to 16,000 years. Today, toxins from harmful algal blooms are the only explanation for repeated mass strandings that include a wide variety of large marine animals. Harmful algal blooms are common along the coasts of continents and they are enhanced by vital nutrients—such as iron—released during erosion and carried by rivers into the ocean. Because the Andes are some of the most iron-rich mountains in the world, the runoff that has occurred along the west coast of South America for around 20 million years has long provided the ideal conditions for harmful algal blooms to form. The site is estimated to be 6 to 9 million years old. This age places the site in the late Miocene (5–11 million years ago), which was millions of years before humans arrived in South America. Where were the findings published? The paper, “Repeated mass strandings of Miocene marine mammals from Atacama Region of Chile point to sudden death at sea,” was published in the Proceedings of the Royal Society B. The lead author on the paper is Nicholas Pyenson of the Smithsonian’s National Museum of Natural History. What is happening at the site now? All of the fossils found between 2010 and 2013 have been moved to museums in the Chilean cities of Caldera and Santiago, and many await careful preparation. Expansion of the road is now complete, and the northbound lane, where many of these fossils were documented, is now paved over. This enormous wealth of fossils, however, represents only a fraction of the potential at Cerro Ballena, which remains unexcavated. The team conservatively estimates that the entire area preserves several hundred fossil marine mammal skeletons. The Smithsonian has archived the large digital datasets collected during fieldwork at Cerro Ballena. People can now download or interact with 3-D models of the fossil baleen whale skeletons, scan Google Earth maps of the excavation quarries, look at a vast collection of high-resolution field photos and videos or take 360-degree tours of the site.